Wards 11 and 12, York South-Weston, are located in the near northwest side of Toronto, stradding the former Cities of York and North York. Ward 11 includes the neighbourhoods of Weston, Pelmo Park, Mount Dennis, and Rockcliffe-Smythe. Thes outheast corner of the Ward 12 includes the former Toronto Stockyards and its associated industries; those lands are now mostly redeveloped into big-box retail and townhouse developments. Ward 12, east of Jane Street and the Metrolinx/Canadian Pacific rail corridor, includes the Rustic-Maple Leaf, Amesbury, Beechbrook, and Keelesdale neighbourhoods. Compared to Toronto as a whole, both wards are relatively lower-income (the average household income in 2010 in Ward 11 was $61,883 in 2010; in Ward 12, it was $61,621); both wards are made up of a mix of housing types, from post-war subdivisions (many populated by older Italian and Portugese-Canadian families) and highrise residential towers. In the mayoral race, Doug Ford took both wards by a landslide; Ford got 56.6% of the vote in Ward 11 and 62.3% in Ward 12. John Tory and Olivia Chow came in a distant second and third place, respectively. Ford came in first place in all but five polls in York South-Weston. 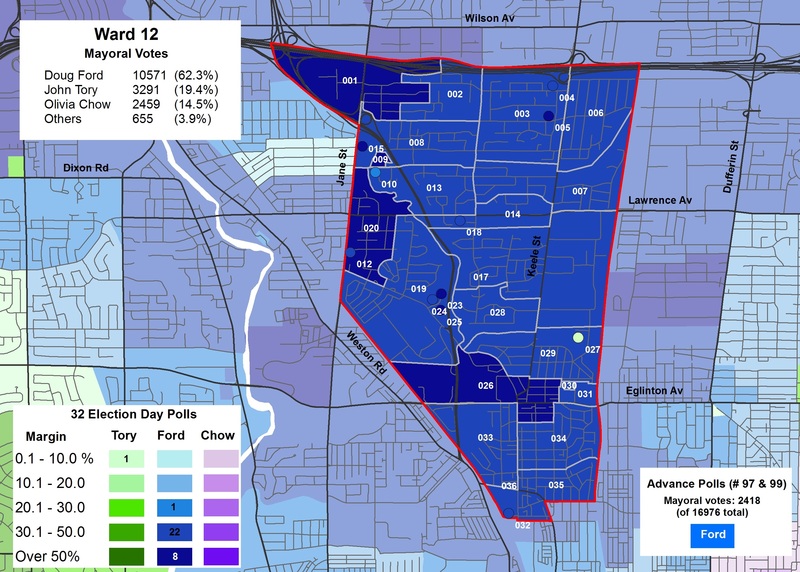 In Ward 11, Tory won four polls located at 240-270 Scarlett Road, the Lambton Square condominium towers. In Ward 12, Tory placed first in Poll 027, a seniors’ residence near the old Northwestern Hospital. The councillor in Ward 11 is former York mayor Frances Nunziata, who has sat on Toronto City Council since amalgamation. She was one of Mayor Rob Ford’s closest allies; she served as council speaker in the last term. As speaker, she had trouble keeping order on council. though newly elected mayor John Tory has since nominated her for the job. Only 19 of 44 councillors were willing to challenge the nomination, so for now, she remains in her current role. In the last election, Frances Nunziata won with 71.3% of the vote. Only two other candidates ran: Jose Garcia (netting 17.4% of the vote) and Dory Chalhoub (who got 11.3%). 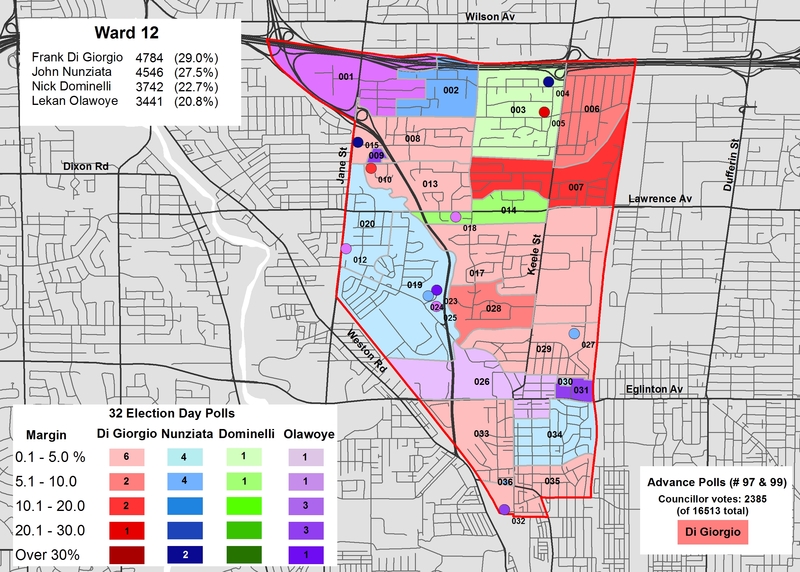 I didn’t bother making a map for the council race in Ward 11 as Nunziata won every poll by a comfortable margin. 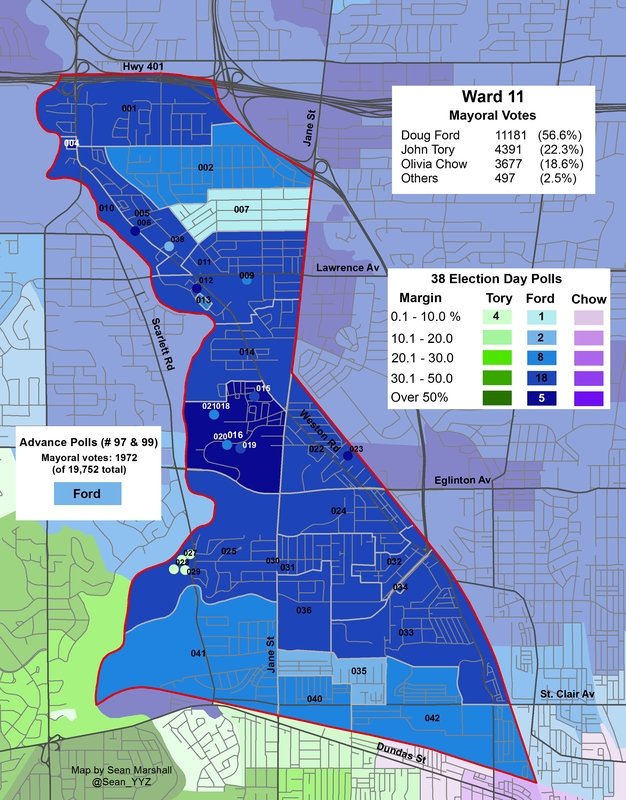 On the other hand, the council race in Ward 12 was much more interesting. This was a bonafide four-way race between incumbent Frank Di Giorgio, returning challenger and former city staffer Nick Dominelli, former Liberal/Independent MP John Nunziata (Frances’ brother) and new challenger Lekan Olawoye, a Nigerian-Canadian immigrant and local community organizer. Olawoye won nine election day polls (more than Nunziata or Dominelli). Some of these polls, such as Poll 001 (which includes a large TCHC complex), are where Doug Ford did best in the mayoral race, similar to results seen in Ward 6. The polls that Olawoye won were mostly high-rise residental towers, including private rentals, co-operative homes, and TCHC properties. Di Giorgio and Dominelli did the best in the northeast, in the Maple Leaf/Rustic neighbourhoods. To repeat a point I made earlier, I am impressed to see great, young, passionate candidates in northwest Toronto who want to do better for this city. I strongly believe that we need more diversity on city council. I am inspired by people like Andray Domise, Idil Burale, Abukar and Olawoye. Happily, we will hear a lot more from these inspiring leaders in the years to come. This entry was posted in Election, Maps and tagged 2014 Election, Ward 11, Ward 12. Bookmark the permalink.